Please come and see us and look through our portfolio of wedding cakes, choose the designs and styles you like and together we will create your dream wedding cake. We make all the sugar flowers we use on our cakes so they can be made in your wedding colours and to match the wedding bouquet and flowers. Tiered wedding cakes can be all the same flavour or each tier a different flavour. You can choose. Have a look at the cake flavours page to see some of our more popular cake flavours. Chocolate wedding cakes are increasingly popular. All of our chocolate cakes are created using the best quality chocolate. Cake designs can be made with dark, milk or white chocolate or a combination of all three. They taste wonderful and many couples choose to serve their chocolate wedding cake as dessert. 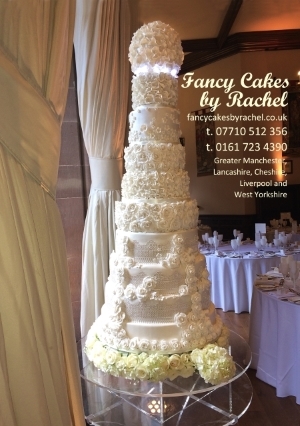 We have a selection of wedding cake stands for hire, including a crystal stand with a water fountain for those who would like a little extra drama from their cake and the very popular crystal pillars. There is also a refundable deposit for cake stands, this is to cover the cost of replacement if the stand is damaged or not returned within 3 days.